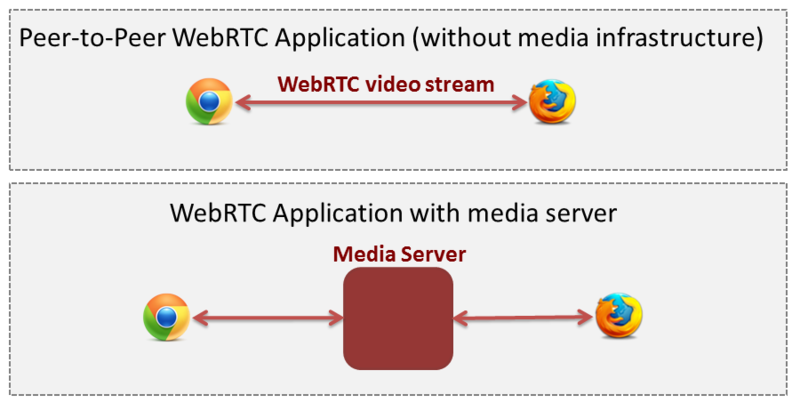 Conceptually, a WebRTC media server is just a kind of “multimedia middleware” (it is in the middle of the communicating peers) where media traffic pass through when moving from source to destinations. Media servers are capable of processing media streams and offering different types including groups communications (distributing the media stream one peer generates among several receivers, i.e. acting as Multi-Conference Unit, MCU), mixing (transforming several incoming stream into one single composite stream), transcoding (adapting codecs and formats between incompatible clients), recording (storing in a persistent way the media exchanged among peers), etc. Kurento, the Real-time Processing Stream Oriented GE, has been conceived as a WebRTC capable media server. At the heart of the Kurento architecture there is a media server called the Kurento Media Server (KMS). Kurento Media Server is based on pluggable media processing capabilities meaning that any of its provided features is a pluggable module that can be activated or deactivated. Moreover, developers can seamlessly create additional modules extending Kurento Media Server with new functionalities which can be plugged dynamically. Kurento Media Server provides, out of the box, group communications, mixing, transcoding, recording and playing. In addition, it also provides advanced modules for media processing including computer vision, augmented reality, alpha blending and much more. Besides, Kurento Media Server is capable of receiving video streams from most types of IP cameras supporting the RTSP or HTTP protocols.